So, what’s on your playlist today? I’ve talked about my desire for this space to become a safe community where hard issues are discussed, where sensitive issues are given air time, where real relationships are formed, and where world views are expanded. I genuinely believe that authentic relationships can be cultivated online. I know couples who have met online and gone on to have fantastically healthy relationships and marriages. I know friends who have met online who continue to be each others’ #1 support, despite the thousand miles between them. I know families that are separated by land and sea who manage to stay close thanks to the internet. At the very, very least, I believe that online community is far, far better than no community. And there are times in life when online community may be the only option. I’m a mom who works from home while caring for three kids aged 7, 5, and 11 months. These days, it’s really hard to get out of the house to create community. I cannot meet all of my responsibilities and simultaneously host or participate in daily community building activities (play dates, book clubs, mom groups, etc…). But I greatly desire the opportunity to interact with others on a regular basis and even find a few people who might just understand what it’s like to participate in a conference call at 11:00 and endure an episode of Power Rangers at noon. That’s where the (in)courage Community Groups come in. 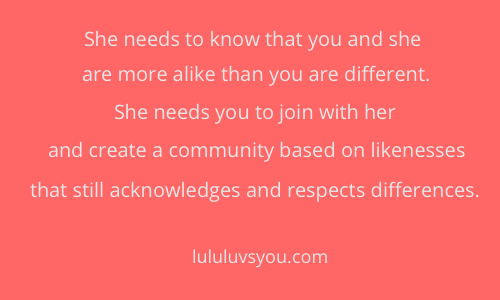 These online groups of women are created to provide an opportunity for women who are in need of community to find a space where they can be encouraged, find support, and invest in others . There are groups that are geared to all sorts of women in all sorts of situations. This season, I’ll be co-leading a group for moms who are working from home. I’m excited to be partnered with Becky, from Time-Out with Becky. We’ve named our group Ampersand, and you can register for the group by visiting our group page. If you’d like to join an (in)courager Group but feel like Ampersand isn’t your cup of tea, I highly encourage you to browse through the full list of offerings! There are over 70 groups, and I’ve had the pleasure of getting to know many of these women over the past couple of weeks as we’ve prepared for this time. I think you’ll be greatly encouraged by your participation. So, go ahead, pop over to the (in)courage Community Groups section and dive in! Yesterday we went to the zoo with some new friends of ours. Burke, my five year old son, was intent on playing at the playground, and his friend, Lucy, was totally cool with that plan. They climbed up ladders, ran across bridges, came down the slides, and enjoyed the swings. After a bit, the mommas told them it was time for lunch. So we headed out of the playground and started walking toward the cafe. I grabbed Burke’s hand, and Lucy grabbed her Momma’s. Then, she reached out to grab Burke’s. In an unnatural move, he pulled his hand back. She reached again, and he pulled back again. “And mine is, too!” Lucy exclaimed, turning her hand over. Sure enough, peachy smooth skin presented itself for Burke to consider. “See, Burke? It’s no big deal,” I said. “Hmm…yep,” he answered and started to skip toward the cafe. We went on to have lunch and to see the tigers, the gorillas, and one very hairy camel. When it was time to leave, Lucy opened her arms for a hug, and I held my breath. I held my breath and prayed that Burke wouldn’t make a scene. And he didn’t. He grabbed Lucy in a big hug, and I exhaled. “Ewww!” he screamed, running away. Lucy’s mom and I laughed and headed to our cars. Once again, I held my breath as I asked Burke about his reaction. How am I handling this? Clumsily. Very, very clumsily. I feel awkward and ill-equipped. I feel ignorant and unsure. I feel like I’m going to mess them up or make it worse. But I’m going to try anyway. I’m starting by opening the lines of communication. I’m talking about it with my kids. I’m not shying away from their questions or reactions. I’m not shushing them as if they’ve said something wrong. They’re expressing their observances. Yes, Lucy’s skin is brown. Yes, it feels different. There’s nothing wrong about that, and there’s nothing wrong with Burke pointing it out. My job is to help him figure out what to do with that information. And so I’m trying. This post is the fifth in a series titled “But I’m Not Racist!” You can see the full list of posts here. Please join me as I carefully tread this sacred ground. Ruby lives in a colorful world. If she were to create a portrait of the major players in her life right now, she’d need the entire box of Crayola’s Multi-Cultural crayons. And I like it that way. We have made conscientious, intentional choices to plant our family in diverse communities, and we have actively sought to engage in our communities. We’ve done our best to create a home and lifestyle that welcome and include people of color. But there are certain parts of life over which we have absolutely no control. Specifically, other peoples’ spouses. The romantic couples in Ruby’s life are overwhelmingly monochromatic. Even the mothers and fathers in her favorite television shows “match” their partners. Off the top of my head, I can only think of three interracial couples that Ruby’s ever known, and she’s only known them peripherally. My intelligent young daughter was able to observe the fact that interracial couples are different from the norm…uncommon, even rare. 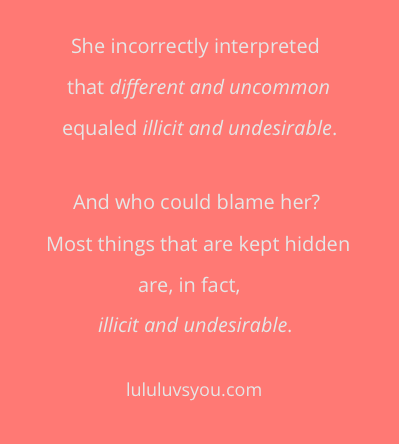 But she incorrectly interpreted that different and uncommon equaled illicit and undesirable. And who could blame her? Most things that are kept hidden are, in fact, illicit or undesirable. As a society, we have progressed to the point where overtly racist statements are condemned and, at times, sanctioned. But that doesn’t mean that passive racist messages have been eliminated. That doesn’t mean that prejudiced viewpoints are no longer given air time. I naively assumed that eliminating racist and prejudiced language from our home would insulate my daughter from what remained of society’s racist messages. I wanted to give her a chance to draw her own conclusions and make up her own decisions about the world. My intention was to give her a neutral space. I accidentally created a cavernous void. And the messages from society echoed again and again. We must discuss these things with our children. This post is the third in a series titled “But I’m Not Racist!” You can see the full list of posts here. Please join me as I carefully tread this sacred ground. One of the things that intrigued me about Ruby’s revelation was that, as far as I had noticed, none of the boys in Ruby’s class had brown skin. So I asked her if she would point Jason out to me the next day at pick-up. At 2:30, I stood in the hallway and watched 24 kids file out of Ruby’s classroom…the only brown skin belonged to a little girl with long black braids. “Yes, Mom! He’s right there!” she answered through clenched teeth. She was pointing straight to a boy with jet black hair and skin that could barely be classified as beige. She grabbed my hand, and we quickly (and discreetly) made our exit. As soon as we were across the street, Ruby opened up a little bit. Clearly, my daughter had fallen for the seven-year-old version of her father. The shock of the day before was quelled by the fact that my kiddo really could see beyond color and into the things that matter. I was encouraged by the fact that her heart had naturally fallen for someone who possessed admirable qualities, even though his skin didn’t match hers. But these facts made it harder for me to understand how she could think it was wrong to like Jason and, even worse, be afraid to tell me about it. Even though Ruby could recognize and acknowledge Jason’s valuable and admirable qualities, his race had become his most defining quality. She didn’t trust the adults in her world to consider anything other than the color of his skin. Over the next couple of weeks, I began to pay attention to Ruby’s world from a different viewpoint. I researched and read articles related to the things we were experiencing. I talked with friends and acquaintances who are better equipped to address these issues. And I prayed. Someone once told me that children are excellent observers and terrible interpreters. 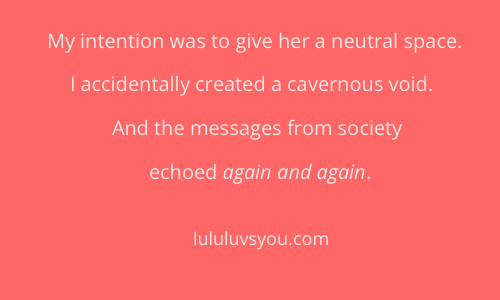 Society is sending messages to my daughter non-stop, and she’s astute enough to pick up on the vast majority of them. It is my job to help her evaluate these messages and interpret their meaning in her life. For seven years, I assumed that providing an open, inclusive atmosphere in our home would be enough to instill an open, inclusive worldview in my daughter’s heart. Now, I know that’s not enough. This post is the second in a new series titled “But I’m Not Racist!” You can read the first here. Please join me as I carefully tread this sacred ground.